My headlights failed inspection because they were too oxidized and dim. They wanted to charge me $91 for it. Not a totally unfair price to pass inspection for a whole year; but of course, I didn't want to pay. 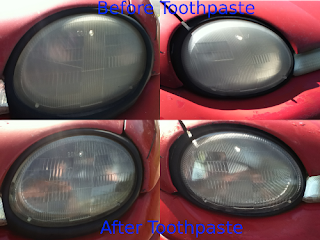 Following the instructions in the video below, I made a drastic improvement in my headlights which allowed my car to pass inspection. My $700 car is still going strong after 6 years with minimal maintenance and always has functioning heat, AC, and stereo. Everything the body needs. Just like the guy in the video, I recommend toothpaste with crystals or granules or whatever you want to call them. The little extra abrasive seems to help. After I was done conditioning the headlights, I sprayed them with WD-40. I do not know if this does anything or why I did it. When I'm alone, the blaineallenbrown.com podcasts require quiet a bit of preparation and inspiration. I am still going to be doing those, but at my leisure. In the mean time, Nick and I have been posting Game Performance videos on Halloween Bags Early. A while ago I registered halloweenbagsearly.com for a laugh as a reference to my favorite podcast The Jeff and Casey Show. I had been using it for my various projects but never for anything official. When Nick and I decided to make a Game Performance YouTube channel, we knew that was the best name. 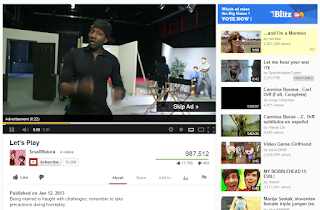 We have several videos up already. Check 'em out. I wrote this essay for class. It could use some more depth (~700 words as per instructions for the assignment) but I liked it so I'm posting it here. As any screenwriter will tell you, all television and film are all structured in the same way. Mainstream TV shows have three acts separated by two plot points. These features are rigorously structured. There are almost no shows that are aired that deviate from this idea. 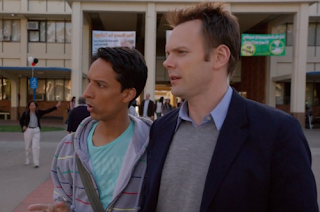 If you look closely, comedy shows share many common features, too. However these are culturally structured. 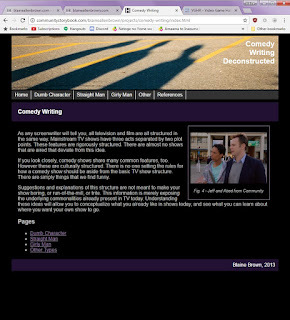 There is no one setting the rules for how a comedy show should be aside from the basic TV show structure. There are simply things that we find funny. Suggestions and explanations of this structure are not meant to make your show boring, or run-of-the-mill, or trite. This information is merely exposing the underlying commonalities already present in TV today. Understanding these ideas will allow you to conceptualize what you already like in shows today, and see what you can learn about where you want your own show to go. 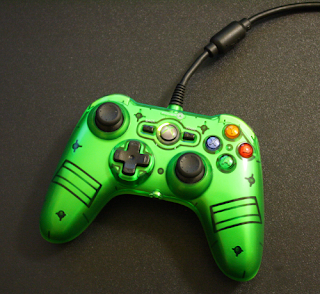 The Mini Pro EX wired controller for Xbox 360 by Power A is the best modern controller I've found. Below are the major points to note. I wrote this essay for class. It could use some more depth (~600 words as per instructions for the assignment) but I liked it so I'm posting it here. Here is something I made by messing around in Gimp. 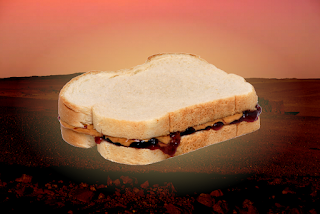 I merged a picture of a desert with a red background to make it look like Mars, and then I added a sandwich. I then used the gradient tool with a radial setting to make the sandwich seem like it's the most glorious thing in the Mars. Delicious. Originally Posted on a blog for a class project. I liked this image so I wanted to share it here as well. Today, Lindsay Small-Butera, co-creator of Baman Piderman, posted a complaint on her Tumblr about a site called Videohall that downloaded her work from YouTube and posted it to the Videohall Tumblr without including a source. I have a few thoughts about the whole thing. "Hey mother fuckers. Thanks for stealing my video by ripping it off of youtube, putting an mp4 of it on your site, not sourcing it at all, and getting a ton of notes." "Stealing" is kind of a nebulous term. Usually we use stealing to indicate taking a physical object, but in media it is often called stealing when a number of different things happen. Piracy is one example, where someone takes a digital item (video, music, software) and distributes it to other people without paying the creator. So the kind of "theft" that Videohall has committed is much more accurately categorized as piracy. Design Rules is a series of posts I'd like to continue to make, where I focus on one aspect of design. This one is a mistake that is so obvious, and yet, it keeps happening in new products that come out. Hopefully I can worm my way into the backs of people's minds so that they will intuitively know that these designs are bad ideas. Design Rule #1: Never install a lanyard into the cap Imagine you purchase a product like a flash drive. It comes with a cap to cover the metal contacts that will connect to your computer. 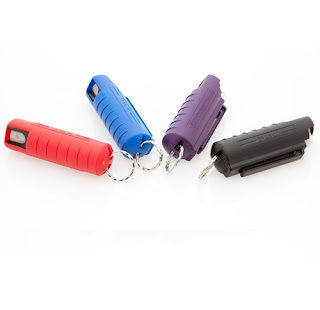 Also, for your convenience, the flash drive has a lanyard, or some sort of lanyard attachment hook, so you can connect the drive to your keychain.